Volunteers are the unsung heroes of drum corps, putting in as many hours behind the scenes as members do on the field. They cook for hungry performers and staff, sew flags, drive trucks, and perform countless other tasks and activities at all hours of the day. Though they receive no compensation for their hard work, their incredible efforts combined are what keep corps in operation leading up to and during every summer season. After nominations were submitted by corps directors and staff members through the winter and spring, the following award recipients were evaluated and selected by a panel of Friends of DCI members. These 2011 Volunteers of the Year will be honored for their contributions this August during the DCI World Championships in Indianapolis. Known as 7th Regiment's "clerk of the works," Daisy Johnson has served in a variety of roles for the corps including secretary of the board, treasurer, volunteer coordinator, fundraiser and more. Miss Daisy, as she's affectionately known to staff and members, has been a part of the drum corps activity since the early 1970s with the Surfers Drum & Bugle Corps, which evolved to become the parent organization of the 7th Regiment when the corps was conceived in 2002. "She makes a point of getting to know each member of the corps individually, and still at the age of 82, she proudly walks alongside the corps with a water bottle in parades," says 7th Regiment Director Tim Rall. 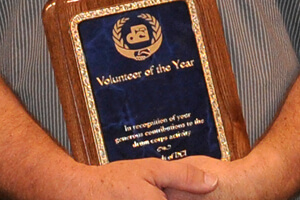 "There is a core group of six volunteers—three married couples who no longer have children in the corps—who between them have racked up such an impressive amount of service to the corps, it would be impossible for us to recommend any one of them for this prestigious award without recommending all six," said Jersey Surf Executive Director Bob Jacobs in nominating the "Surf-Six" for the 2011 Volunteer of the Year awards. Among the six are Beverly and Ted Vallies, Naomi and Tom Piatek, and Terri and Bill Ives, who over the years have accrued thousands of volunteer hours with the New Jersey corps. When it comes to helping corps members, no job is too big or too small for this dynamic group, from administrative duties, mending uniforms and building props to painting trucks, cleaning buses and cooking food. "These individuals create great memories for corps members and sometimes even a few drum corps fans as well!" says Jacobs. "They go out of their way to spread goodwill, representing the organization and the activity at the highest level with school administrators, new parents and others wishing to 'learn the ropes' of supporting an elite marching unit in DCI, whether from our corps or not." Rick Vale has been a volunteer on the Cadets' medical team since 1999, the year his son Chris joined the corps as a snare drummer. Though Chris aged out of the corps five years later, Rick has been involved with the organization every year since. From flying out to attend winter rehearsal camps to joining the corps for several weeks at a time on the road during the summer, his volunteer efforts for the Cadets are year round. "Rick is the reason that we've come such a long way in providing a safe, healthy environment for all participants of the Cadets," said Assistant Director Justin Heimbecker. "Rick has served as a trainer's trainer, a mentor to each and every one of [our medical team professionals], to take the level of service provided by the Cadets to an entirely new level. Our organization is able to serve the members of the Cadets like never before, and it's all thanks to Rick's commitment, consistency, and dedication." A truly selfless individual, Heimbecker says that whenever he tries to pay Vale a compliment, he always responds, "I'm just doing my part … the performers, the staff—You guys are the heroes." Congratulations to these additional individuals who were nominated as part of this year's Volunteer of the Year selection process. Please join us in giving special thanks to these and all of the volunteers who make drum corps organizations successful year round!